Fair Use Week is an annual celebration held the last week of February. 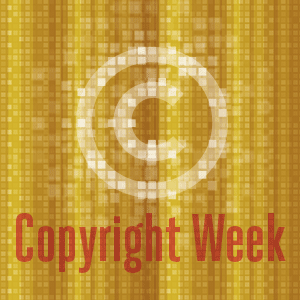 Fair Use Week 2015 will take place from Monday, February 23, through Friday, February 27. It celebrates the important doctrines of fair use in the United States and fair dealing in Canada and other jurisdictions. Fair use and fair dealing are essential limitations and exceptions to copyright, allowing the use of copyrighted materials without permission from the copyright holder under certain circumstances. Fair use and fair dealing are flexible doctrines, allowing copyright to adapt to new technologies. These doctrines facilitate balance in copyright law, promoting further progress and accommodating freedom of speech and expression. While fair use and fair dealing is employed on a daily basis by students, faculty, librarians, journalists, and all users of copyrighted material, Fair Use Week is a time to promote and discuss the opportunities presented, celebrate successful stories and explain the doctrine. via About | Fair Use Week. Over the past two years, as talk of copyright reform has escalated, weâ€™ve also heard complaints about the supposed expansion of fair use, or “fair use creep.â€ That kind of talk woefully misunderstands how fair use works. Fair Use Is Not An Exception to Copyright, Itâ€™s Essential to Copyright | Electronic Frontier Foundation. A landmark fair use ruling: a judge in the Southern District Court of New York has ruled that Google’s program of scanning books for libraries, and giving them copies to use for full-text search is fair use. The suit was brought by the Authors’ Guild against the Hathitrust Digital Library, which holds the digital books for the library. via Scanning whole books is fair use – Boing Boing.